Monitoring and accountability are important for us at an organisational level. Monitoring our work allows us to measure our progress and check we are on track to reach our targets. We look at what is working and what needs to change for us to make a bigger difference. We report to our donors and supporters on work that they have helped make happen, so they can see how their support is contributing to real change. We are accountable to the people we work with and the communities whose lives we aim to transform. Monitoring and evaluating our work lets them know if we are delivering on our commitments and taking responsibility for our actions in an inclusive and transparent way. Our teams around the world follow a set of minimum requirements related to the planning, monitoring, evaluation and reporting (PMER) of their programmes and projects. These are called the PMER Core Procedures and they ensure a consistent approach across WaterAid. The PMER Core Procedures support the Programme Accountability Framework, which defines the nine commitments we make to be accountable to our stakeholders. 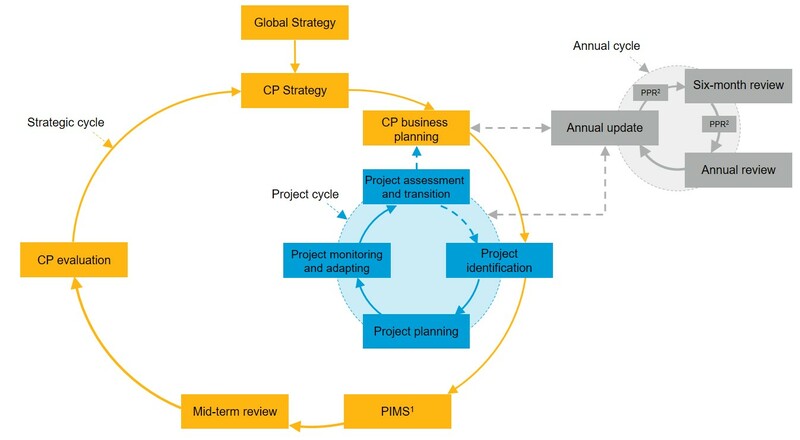 The PMER Core Procedures outline the key processes needed to ensure we plan, monitor, evaluate and report on our work (as outlined in the PMER cycle below). Our national teams develop a five-year strategic plan, define the programmes through which the strategy will be delivered, and implement projects over time to achieve the programme. Four times a year, they take time to reflect on their progress, identify successes and challenges, and, most importantly, make changes to their planned activities. This makes their work agile, adaptive and responsive to changes. These programme performance reflections are an important way of discussing progress with partners and stakeholders. Post-implementation monitoring is an internal process designed to assess the sustainability and effectiveness of our work after it has been implemented. It highlights any challenges around a specific water point or sanitation facility, and can trigger further studies into the causes of issues raised. Surveys are designed to drive learning and adaption, so that we address areas of weakness in our overall approaches and target specific aspects of sustainability. Every national team carries out a post-implementation monitoring survey (PIMS) during their five-year strategy (informing either the mid-term review or final evaluation – see below). The findings help refine the design of future work. Increasingly, we use mobile data collection to conduct data gathering and analysis; our preferred tool being mWater. This streamlines the monitoring process, giving us better quality, reliably geo-located data with inbuilt validation. It brings the data into one place, so we can make better comparative analysis, and enables data to be more effectively shared and used to make change happen. Throughout the life of a national strategy, there are a number of opportunities for us to assess our progress. Halfway through the strategy, there is a mid-term review, and towards the end of the strategy an evaluation. Both of these stages are external validations of our work, assessing the high-level progress, reflecting on the appropriateness and effectiveness of our work, and informing our current and future plans. By monitoring and reflecting, we continually learn, grow and improve as an organisation. Evaluation reports are shared on our website and we hold ourselves to account by sharing our own learning with others, such as through our blogs.